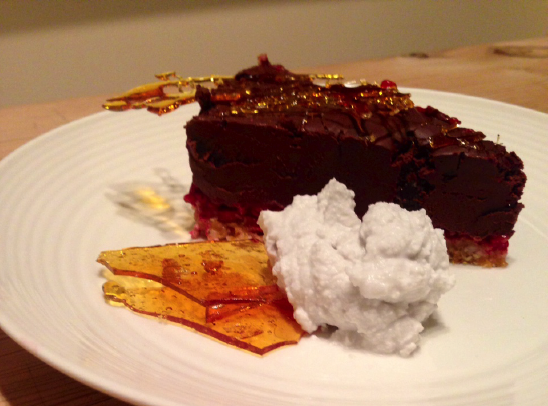 A rich dessert that will impress even your non-vegan friends… I promise! Notes: This tart is ridiculously rich so you only need small slices, however you can reduce the amount of ganache you put on the tart if you want less ratio of chocolate and enjoy the leftovers as fudge! If you want to serve with whipped coconut cream, place a tin in the fridge over night. See instructions below. Soak the apricots over night or pour warm water over them and let them sit for a few minutes to soak up some moisture. Drain them and blend in a food processor. You could also use medjool dates if you wanted. Add the mixed nuts to the food processor and blend again until fine. Line a cake tin with balking paper and press the mixture firmly into the base of the tin. On top of the base, add the frozen raspberries and crush them so that there are no gaps. Set aside in the freezer to firm while you make filling. Get your base out of the freezer and pour the ganache on top of the raspberries. Place in the freezer to firm for an hour or so. When you are ready to serve, remove from freezer and top with your choice of ingredients. I chose to make some hard toffee and whipped coconut cream for the side. Lay out a piece of baking paper on a flat surface. I traced around my baking tin so that my toffee would be the right size. In a saucepan place the sugar and water on low heat stirring regularly. Wait until all the sugar is dissolved then bring heat up to high. Stir constantly. You will know the toffee is done when it turns golden brown. At this point, take off the heat. If you want one big solid toffee, you can pour the mixture straight onto the paper and allow it to cool. If you want the woven effect, let the mixture sit for about a minute – it should become stringy when you pull your spoon out. You can then zigzag it on the paper in all directions. Allow it to cool and it will become solid. 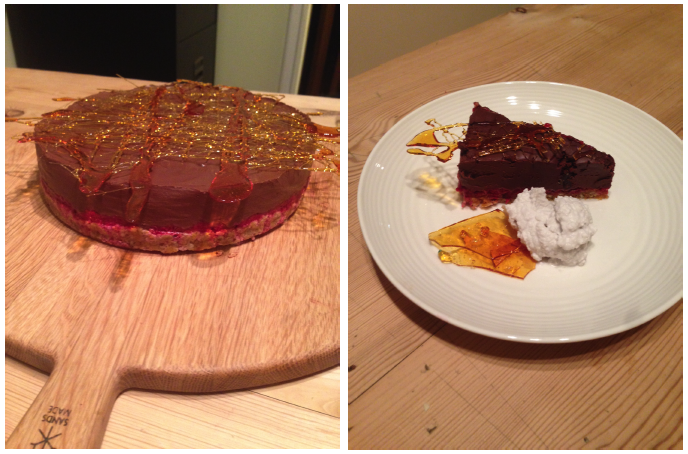 This made enough toffee for me to have a go at both! So I broke up the solid one to serve on the side. *I tried this with brown sugar and it doesn’t work! Brown sugar gets to a certain temperature and then turns back into sugar granules... not helpful for smooth toffee! Place a tin of coconut cream in the fridge overnight or at least for a few hours. This will make the cream solid and help to separate it from the other liquid in the tin. Open the tin and spoon out the solid cream into a mixing bowl. Using an electric beater, whisk the cream. It will soften up and turn a similar consistency to regular whipped cream. You can add vanilla bean seeds if you want a bit of extra flavor. If you have left over, it will keep in the fridge for a couple of days and you can use the left over liquid from the can in smoothies etc.